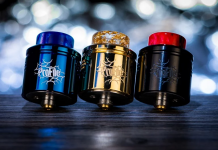 Today I will review Aladdin RDA by Kaees, a 24mm, single terminal, two post build deck with gold plated positive posts and a triple airflow system. As you know, RDA is the most important part to get the perfect taste. 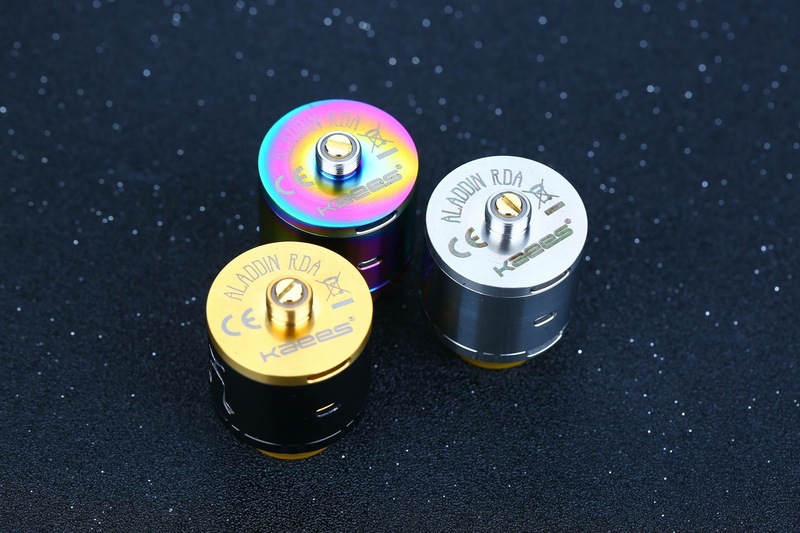 Kaees Aladdin RDA has a triple airflow that allows you to obtain honest result. Ok, here is the deal. This is not the best RDA I have ever reviewed. But for triple airflow, it’s a good innovation. Airflow enters the Aladdin via top side diagonal adjustable airflow which focuses on flavor, side adjustable airflow which is dedicated for the coils, and bottom airflow measuring at 7mm by 2mm. The top airflow can be adjusted easily because of the ridges, but you can not adjust the bottom airflow. Having many choices is a good thing, but from my point of view, if all the airflows are opened, it’s too wide open for a single coil. So I recommend that you just use top airflow and bottom airflow. For the deck section, already equipped with bottom feeder (bf), the finishing is good, clean, and nice to look at. But unfortunately she only support for single coil. 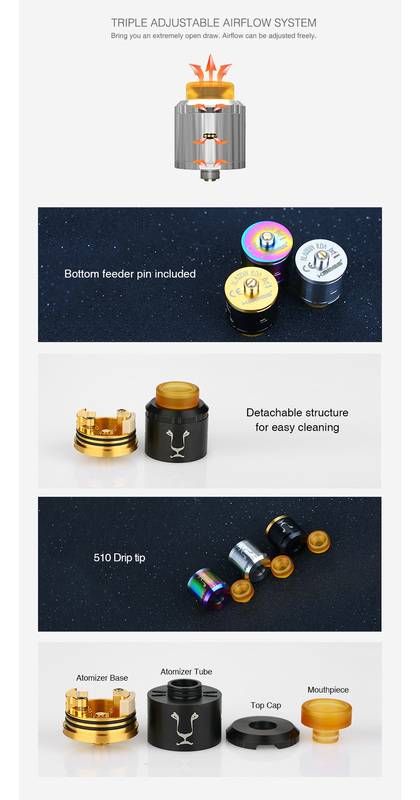 And more unfortunate, gold plated is only seen in Kaees Aladdin RDA which is black color. The last one is on the drip tip. 510 drip tip? In my opinion, 510 drip tip should be small to the end. 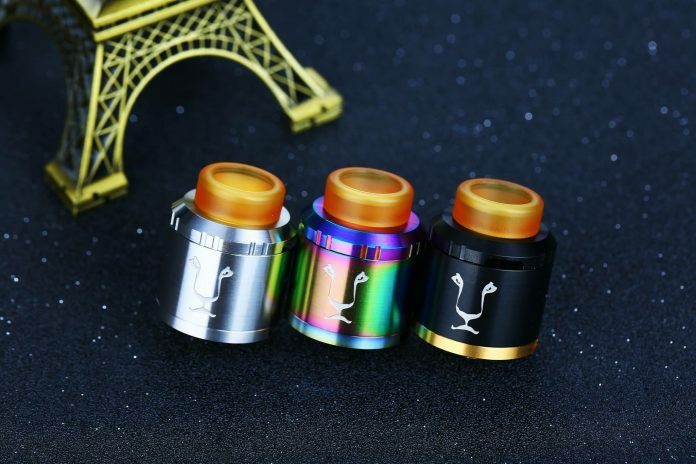 But Kaees Aladdin RDA has a rather unique drip tip and it’s really an innovation that can deceive many people. It looks like 810 but actually it’s 510, which will be cool when Kaees Aladdin RDA is equipped with resin drip tip. Drip tip function is not just a regular mouthpiece, but it is also useful for system lock top airflow controller. 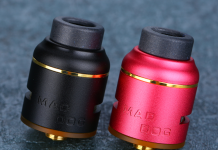 You should open the drip tip to open the airflow top regulator. Okay, the above are all my reviews about Kaees Aladdin RDA. Hopefully, it will be useful for you guys. If let me scale from 1 to 10, I will give this value 8 for flavor. 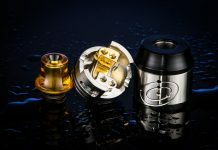 In my opinion, with unique triple airflow system and convenient build deck, the Aladdin 24mm RDA is a stylish, high-functioning bottom feeding rebuildable atomizer at an affordable price! Remember, these are just my opinions. My name is andra wisnu. I am 23 years old male, married. I have been vaping since 2013. I work as an ice hockey coach.